What are they, and how can you be one? 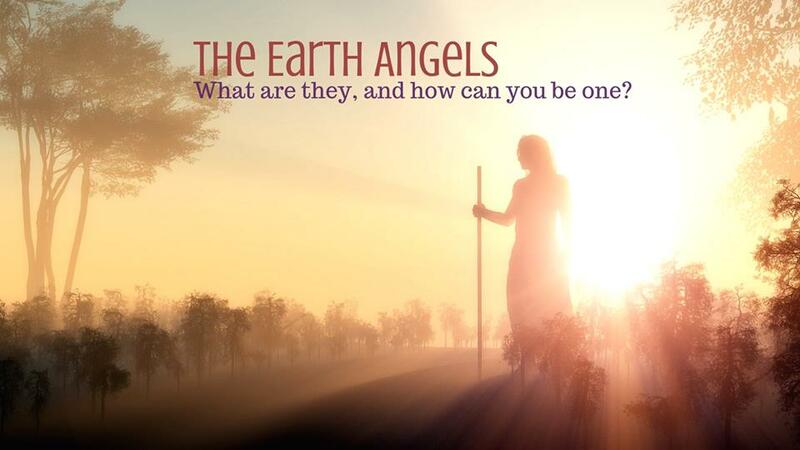 Listen in and learn about how to rediscover the fullness of your own divinely inspired skills, and embrace your angelic Self, so you too can be an Angel emissary. Legendary Master of Voice & Angel Whisperer – STEWART PEARCE was the Head of Voice at the Webber Douglas Academy London from 1980-1997, helped pioneer Shakespeare’s Globe Theatre between 1997-2010, and has coached luminaries such as Eddie Redmayne, Hugh Bonneville, Mark Rylance, Michelle Williams, Marianne Williamson, Gwendoline Christie, Margaret Thatcher, and Diana Princess of Wales to name just a few. Being an Angelic Emissary for over thirty years Stewart has also published “Angels and the Keys to Paradise”, “The Angels of Atlantis” Book & Oracle, the “Angelic Heart Sigils Oracle”, “The Hearts Note” and “The Alchemy of Voice”, alongside several award-winning recordings, such as the “Angels of Atlantis Soul Calls”. Stewart’s next publication will be DIANA: THE VOICE OF CHANGE. 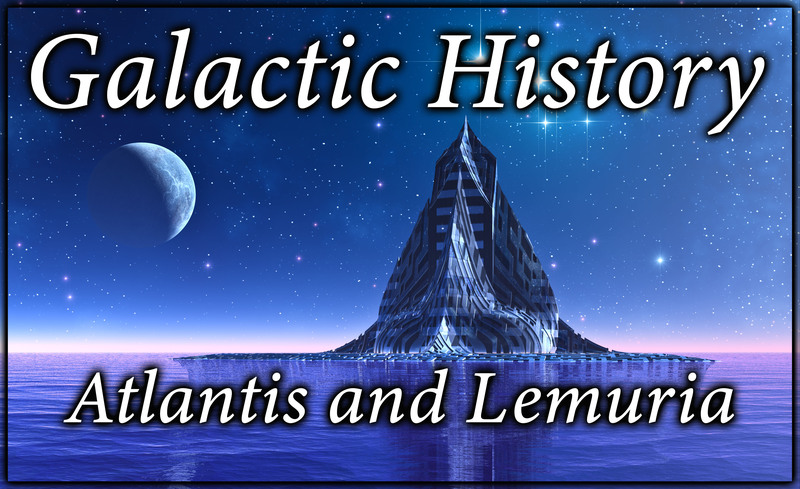 Replay: Galactic History Atlantis & Lemuria NEW HEALING MODALITIES! Who were the first humans on earth, why were they here and how did they get here? You won’t be surprised to know that Atlantians and Lemurians were the first beings on earth. You will, however, be VERY surprised why they chose earth as a place to create the first humans, how the first humans survived and thrived in ancient times, and you will be very happy to know how healing transpired back then! *The Atlantians and Lemurians were the first alchemists, medical intuitives and healers. The Atlantians have a more scientific healing modality that I’d like to share with you in this class. 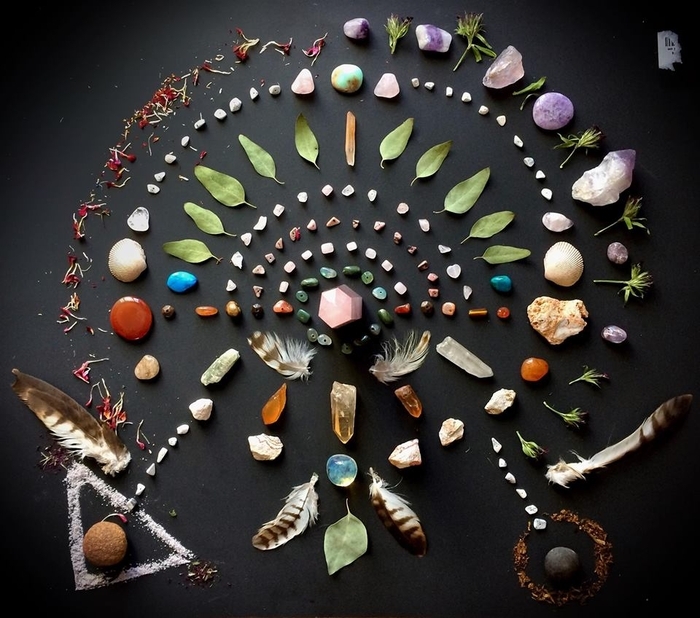 *The Lemurians have a very shamanic healing modality I’d like to share with you. *The first hour of this class will be taught with Pamela sharing the galactic history of earth as it interacted with the Atlantian and Lemurian worlds, along with the sharing of the two specific Atlantian and Lemurian healing modalities. These modalities have caused miracle healings physically, instantaneous or very fast spiritual awakening experiences and have caused many to be on a path to enlightenment. 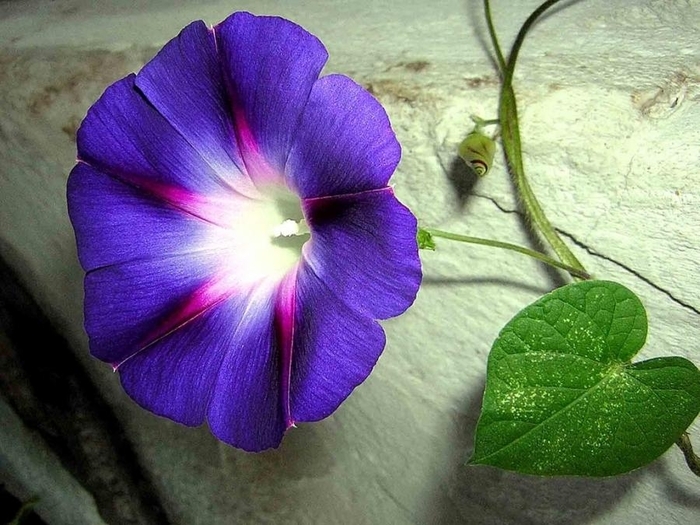 *These are new healing and awakening modalities! So far, I’ve shared one of these modalities with my patreon community, but the other I have not shared except with one on one students who are in my mentorship programs. YOU WILL BE THE FIRST TO KNOW the Lemurian modality. The Atlantian modality also has limited sharing so far on this earth from me. I cannot wait to teach how humanity got to the place of duality expansion such as war, terrorism, disease and mental distress. AND THEN I will teach you how Atlantians and Lemurians have always wished for us to heal from it! In the second hour of the class, I will spend time working with you one on one to answer your questions on screen and to allow you to practice the two Atlantian and Lemurian modalities. I’m tired of this earth game. It’s hard to do this! How can I wake up and maintain my sanity? I’ve decided to address all of the most relevant spiritual awakening and ascension symptoms and to provide a class with literally hundreds of ways to stay safe, grounded and sane during spiritual awakening. This is a very relevant class if you are spiritually awakening, experiencing mental anguish or if you feel lost being on this earth right now. Enjoy learning at your own pace and convenience with our growing library of recorded classes. 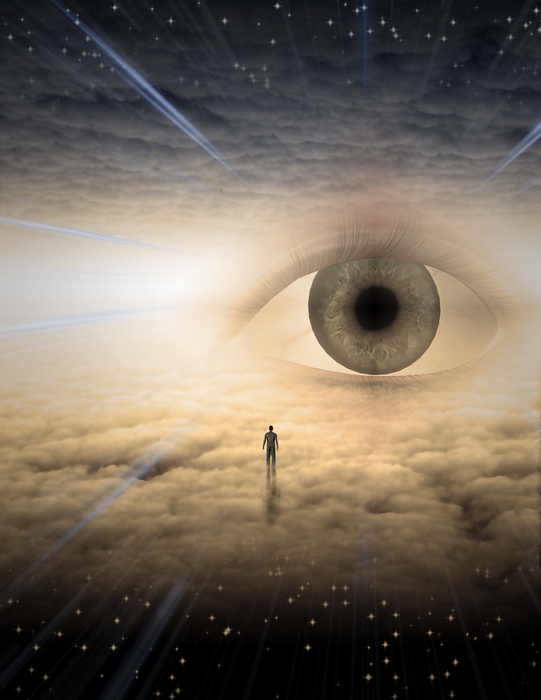 Auras, Chakras & Beyond – Opening the third eye can be an important tool in your life. Joining this detailed class will help anyone who is interested in developing clairvoyance. 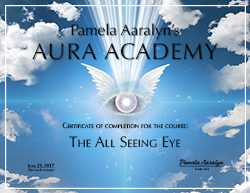 If you’ve been interested in learning to see and interpret auras and chakras, join Pamela as she shares her more powerful techniques for opening the third eye. These are techniques taught to Pamela by ascended masters and archangels since age five. Learn about all layers of the aura and how this applies to not just seeing but interpreting the aura. Seeing through the ether will help those interested in healing, medical mediumship, healing process work and psychic development. Companion Course: The All Seeing Eye Part 2 sold separately – to Learn More about this course click HERE. Being born a clear conduit channel Pamela Aaralyn will teach her unique skills from a personal and inter-dimensional perspective. She will be teaching how to clearly channel many types of inter-dimensional beings such as Archangels, Guardians, Spirit Guides, Humans (living and deceased), Animals and ET Collective Perspective. 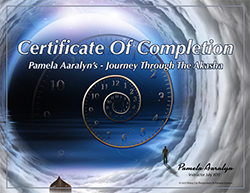 Pamela will address issues and concerns with clear conduit channeling such as blocks in the flow of a channel, overstimulation concerns and how to trust your discernment. Clear conduit channeling is unlike standard mediumship in that the channel must trust their alignment in order for information to flow. Pamela is looking forward to teaching you her specific techniques. This series of four courses is designed to take you from the basics on up to speed with expert channeling/mediumship development. Since each one builds on the previous it is best to do them in order. 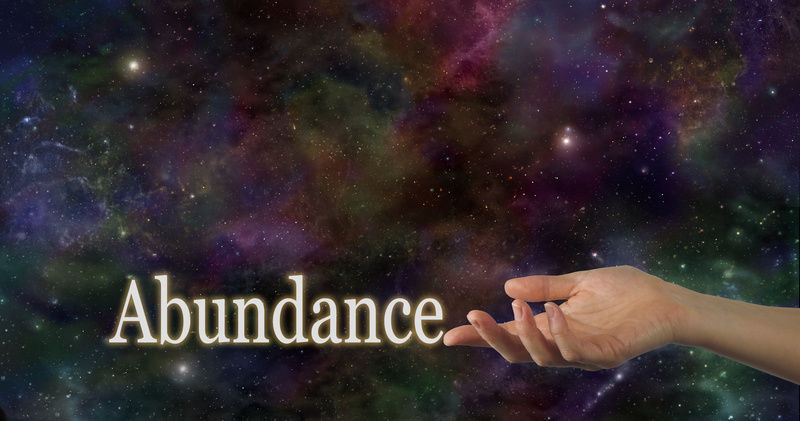 Have you wondered why you aren’t creating in abundance? The key to abundance is freeing yourself from the past, activating yourself in the Present and Creating the future with wonder. Get creative by claiming, activating and operating in your fullest life purpose. What calls your soul? What in this life can activate every cell of your being into Divine sparks of passion, excitement and abundance? How can you find your True Divine Nature and live life by your calling? This and more! This is the video that inspired me to teach this class. This along with the endless questions, “What should I do with my gifts? What is my TRUE calling?” What if we’re all looking at purpose in a very limiting way? What if there is a way to expand beyond the limiting meanings society has created for us about “purpose”? What if you’re not here to do just ONE thing. The idea that you are here to do just ONE thing can even be very limiting. I can’t wait to teach you what the ascended masters and angelics have taught me about purpose, talent and creativity. If you are experiencing “blocks” to your calling, this is the class for you. Watch Pamela as she delivers some of the most incredible Galactic History ever told. Come join the Lion People for their sharing of sacred activation codes that help you align with your unique life purpose and spiritual gifts. 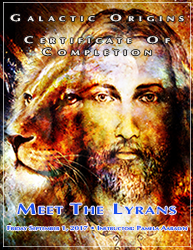 This class will be heavy with alchemy teachings, sacred activations and symbols from the Lyran felines, tips on how to work through the Lion’s Gate portal and teachings on sacred MASTERY of spiritual gifts and life purpose. Come join Pamela Aaralyn as she channels many Pleiadian Collectives. This extensive galactic history class teaches about the Pleiadian involvement in human creation, how Pleiadians began and where they are now in their evolution and how they interact with other galactic beings. 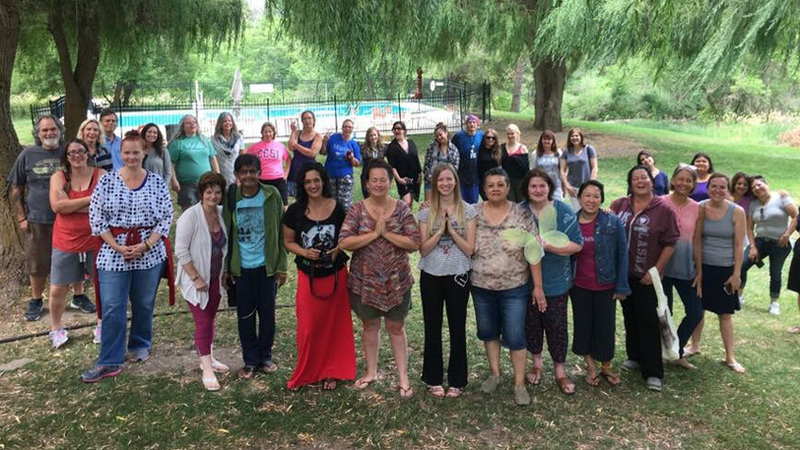 The Pleiadian Collective will also channel through Pamela some very specific teachings on frequency management, how to tame your empathy and how to activate your natural healing abilities. Save $45 on the set. Have you ever wanted to know your past lives or be able to read the past lives of others? Join Pamela Aaralyn, who was handed the keys to the akasha at age five. 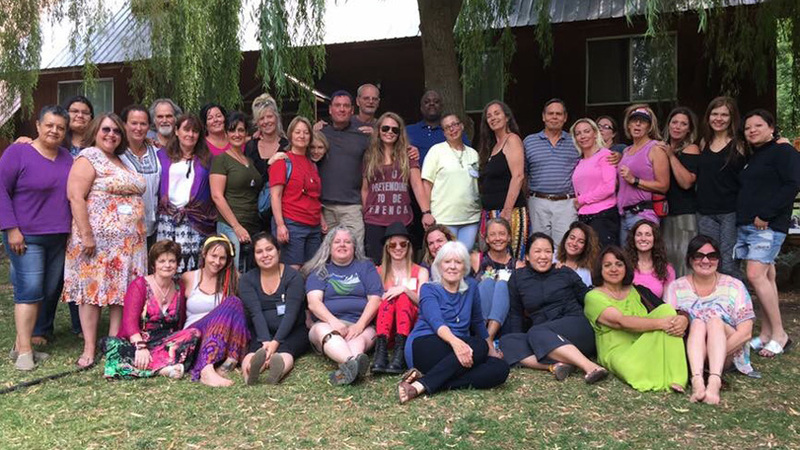 Learn how to talk to the guardians of the akasha, techniques to open portals for travel through the akasha, ethics of akasha review and finally, how to interpret and utilize the akasha for healing trauma. This class also covers a lot of spiritual alchemy techniques that haven’t publicly been shared before by Pamela. Join us for a very special journey through Time. Learn all the basics of medical mediumship: how to tap in using your specific gifts, how to find out which gift you could use that would serve best in medical mediumship (clairaudience, clairsentience, clairvoyance or claircognizance), how to determine if you’re a physical or non-physical medium and how to read the subtle human energy fields (the etheric body, astral body, mental body and Atma (Soul). Correlations and connections between physical conditions and the individual soul. Learn how to identify what you sense in a medical intuitive session and interpret it properly. This is the most IMPORTANT class I offer to the world! The opening to all of our unique spiritual abilities begins with one vital connection: our connection to Higher Self. Soul essence channeling is a way of connecting with Higher Self that is unique because it helps you get in touch (and stay in touch) with your True Divine Nature. It’s the deepest and Truest form of divine telepathy and sentience. If all of our “gifts” began with this, the rest would surely develop accordingly. Soul essence channeling is not only the deepest connection to YOU, it is simple to learn and practice. I can’t wait to share these profound tips with you, as knowing how to speak to the Higher Self clearly helps open all of your spiritual abilities that are dormant. 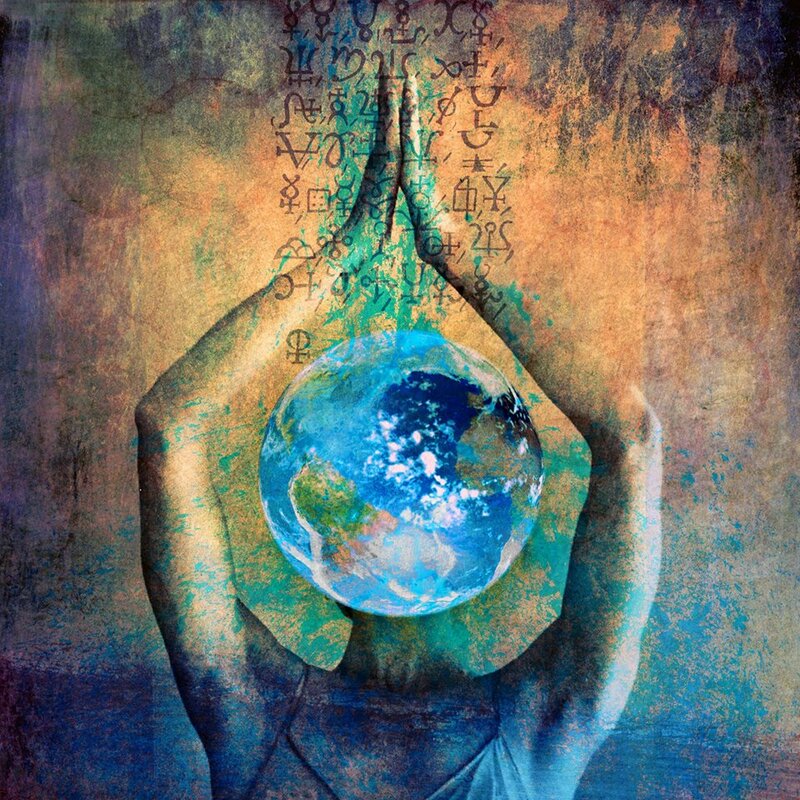 The higher self connection supersedes clairvoyance, clairaudience and even clairsentience because it connects BEYOND the human senses! This class is VITAL for the world to learn. If you are one who struggles with standard extra-sensory perception (you don’t see, hear, etc) this is a great class to help you form a FOUNDATION to all that is beyond the human senses. Senses are secondary. Your connection to clarity in talking to your Higher Self is vital! The next step in being in continual contact with the Higher Self: how to contact the higher selves of loved ones, friends, colleagues, co-workers, family and pets. Have you ever wondered what someone else is thinking? What are their motives and intentions? How can you best serve and communicate with your loved ones? If you could read their DIVINE MIND (the Higher Self), you’d know your next steps in relationships on all levels. Understanding and transforming acute and chronic rare disorders, defects, injuries, and diseases is important to transforming your life into health, happiness and functionality. Come join Pamela as she teaches the interpretation and knowledge of the spiritual contracts and significance of having multiple conditions/diseases and chronic illness. What are the soul contracts, how do these rare situations serve an individual’s purpose and what’s in the highest and best interest of all? How do mental conditions tie into these contracts? What can we do to transcend the body’s suffering? These questions and more will be answered. Transcending the soul contracts in relation to chronic and acute invisible illness, especially conditions of the mind and brain. Be prepared to understand the spiritual connection and contracts involving schizophrenia, bipolar disorder, psychosis, ADHD/ADD, depression, MS, lupus, lyme disease, fibromyalgia, sensory processing disorder, dissociative identity disorder, anxiety disorders, PTSD & more..
Give a unique gift to someone who will truly appreciate it.